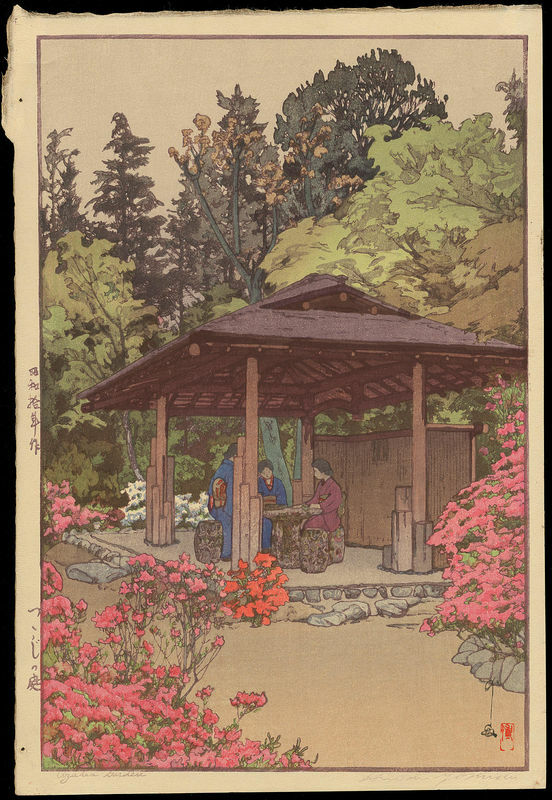 Yoshida, Hiroshi (1876-1950) "Azalea Garden" - Woodblock - Chinese and Japanese woodblock prints for sale, silkscreen, scrolls, watercolor, lithographs. 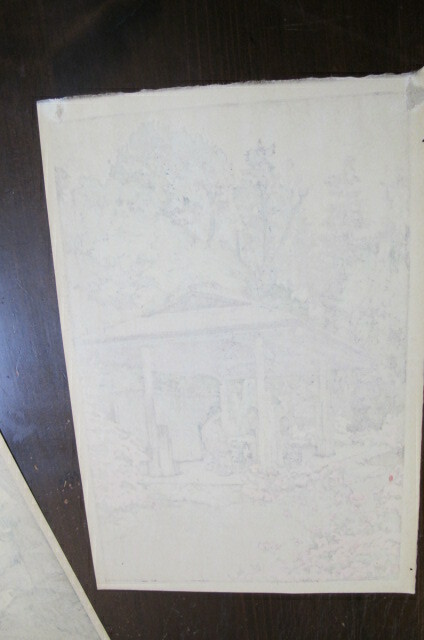 Artwork Details for Yoshida, Hiroshi (1876-1950) "Azalea Garden"
Condition: Fine. Remnants of original folder mount on verso. Notes: Although lacking a jizuri seal, I believe this is one of the earliest 'open edition' strikes with embossed title and artist signature. This print was purchased from a consignment of over 75 woodblock prints (by Koitsu and Yoshida) all with datings from the 1930's to no later than the early 1950s. Of the forty Yoshida prints, this is the only example without the jizuri seal, yet it exhibits the same slight ageing and paper characteristics as the other prints. Early edition with the date and title in the left margin. Signed Yoshida, with artist's seal Hiroshi, in the image area. Vivid, pristine colours. See a discussion of the jizuri seal here. This design is illustrated at plate 200 of Ogura, Tadao et. Al., The Complete Woodblock Prints of Yoshida Hiroshi, Abe Publishing Co., Ltd., (Tokyo, 1987). Azalea Garden illustrates the garden of Yoshida's house in Shimo-ochiai. This print was purchased from a consignment of over 75 woodblock prints (by Koitsu and Yoshida), all with datings from the 1930's to no later than the early 1950's. All but a couple of these prints seem to have never been displayed and have vivid pristine colours on creaseless paper. They were probably purchased and then simply stored for the last 60+ years.